What The Heck Do You Do With Baby Turnips? This. 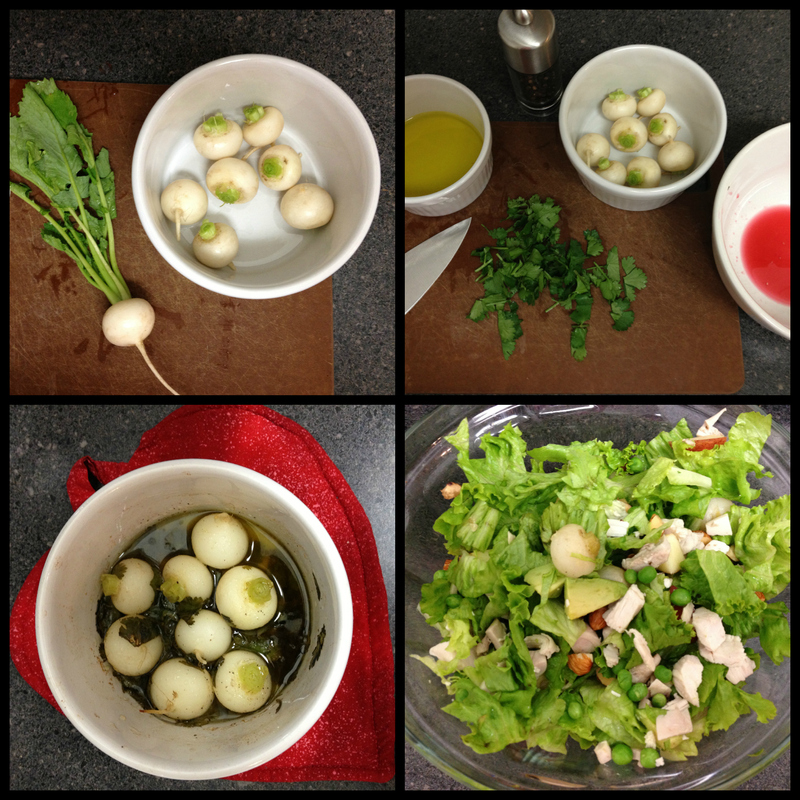 Soft and tangy, baked baby turnips are perfect in a dinner salad. In my first box of produce from Full Circle I found eight teeny, tiny turnips—the smallest ones I’d ever seen! There weren’t enough of them to star in their own main or side dish, so I decided to get a little creative. I trimmed the stalks, tossed the roots in a marinade of fresh-squeezed blood orange juice, olive oil, cilantro, and pepper, and then popped them in the oven for about 40 minutes (covered, 375 degrees). After baking, I sliced up the baby turnips and added them (marinade and all) to a salad of green leaf lettuce, roasted chicken (remnants from dinner a couple nights earlier—yum! ), apples, peas, avocado, almonds, and more cilantro. The result was muy delicioso, and I discovered that salads are great for stretching a small amount of veggies and using up leftovers. Need some convincing to go to all this trouble for a couple of midget turnips? Consider this: Turnips are chock full of vitamin C, an antioxidant that fights free radical cell damage and aids in the absorption of iron. Many runners are deficient of this important mineral, and pairing turnips with protein (like chicken) can improve your body’s uptake of iron. Have you ever tasted a baby turnip? Think you’ll try one now?